Born in 1959, David B. (B. is short for Beauchard) began working in comics and illustration around 1985. In 1990, with a group of six other artists, he co-founded L’Association, the most influential publisher of independent comics in France. 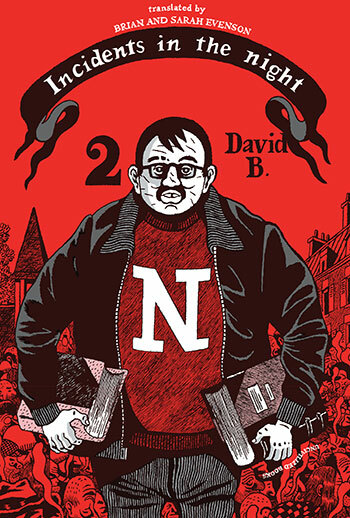 David B.’s elegant, austere aesthetics have influenced that publisher’s distinctive trade dress and design sensibility to the present day, and he is also responsible for mentoring Marjane Satrapi in the development of L’Association’s most successful book, the international best-seller Persepolis. As an artist, he is best known for his acclaimed autobiographical comic Epileptic, published serially in France from 1996 to 2003, about his family’s struggle surrounding his brother’s epilepsy and David’s development as an artist. This was his first book-length work to be translated into English (the first half appeared in 2002 from Fantagraphics, and the complete work was published as a single volume by Pantheon in 2005). Since then, a number of his books have been translated into English, including Babel, Incidents in the Night, and Best of Enemies. 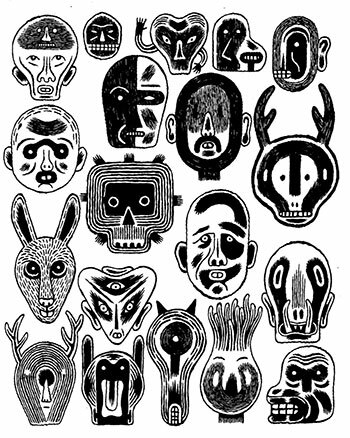 I first became familiar with David B.’s work when I encountered “The Armed Garden” in Mome magazine in 2005 and was amazed by both the distinctiveness of the art and the quality of the narration. From there I went back and read my way through his work and since then have co-translated, with my daughter, Sarah, the first two volumes of Incidents in the Night (Uncivilized Books, 2013 and 2015). Brian Evenson : People have often spoken of your distinctive artistic style. One immediately recognizes your work as your own. How did that style develop? How do you feel it has changed over the years? In fact, I really like to go back to the brush from time to time, to navigate a bit between one tool and the other. There are books that I envision with very contrasted blacks and whites and others with optical grays. I use a pure black-and-white more in the autobiographical work, and in the fictional ones I add nuances. Actually, I write and draw at the same time, nothing is ever finished in advance; the story is always being created as it is taking shape. BE : What people don’t talk about as much is how distinctive your writing is as well. For me it’s exceptionally rare to have a writerly personality joined with a tremendous sense of artistry—it makes your books satisfying simultaneously on two different levels. Do you find the art and the writing develop simultaneously, or do you script things first? DB : What I’m going to narrate has as much importance as what I’m going to draw. I am a teller of stories, I try to say something to my readers, and I want to write this something—which is to say, to have a style as good in the dialogue and the text as in the narration or the drawing. I believe that that’s what makes a writer, what makes his work recognizable. Actually, I write and draw at the same time, nothing is ever finished in advance; the story is always being created as it is taking shape. I reserve for myself in this way surprises, possibilities. BE : Many of your works are interested in printed books—Incidents in the Night in particular—and that interest often has a mystical or esoteric element. What prose writers do you find feed you most as a writer and artist? DB : My parents had a library very well stocked in books on esotericism, magic, symbolism, alchemy, and mysteries of all sorts. Certain books were illustrated and had an effect on my imagination. As far as stories, it was the idea of the “mysterious book” that I liked. In the house there was a book called Accursed Books, about all the secret, hidden books that nobody had ever read because you died if you read them, which admittedly isn’t very practical. I loved this book, which was a catalog of an impossible library. The avid reader that I am can thus make of books fully fledged characters. I read a lot of esotericists; the book that made the biggest impression on me was René Guénon’s The King of the World—I just, by the way, did an exhibition of drawings in France around this theme. I am not a “believer” in esotericism; for me all these writers are astonishing writers of fiction, great creators of worlds. BE : When you were working on the first volume of Incidents in the Night, did you already have in mind the shape and direction of the second volume? Or was that something which came later? DB : I decided to draw the first story after the dream that is found on the first page, which was an actual dream. I found that it opened scriptwriting possibilities for me, and the second volume came little by little. I never write my stories all at once. I move forward bit by bit, and with the first volume finished I realized that there was a second one growing in my head. The idea is of course to do a serial about a serial, so to have episodic sequels. DB : The delay between the two publications was due to the disruptions that took place at L’Association. After the appearance of the first series, I was, shall we say, pushed out of the organization by Jean-Christophe Menu, and I didn’t want to publish there any longer. I had started to draw the sequel, but I kept it to myself. Les Éditions Casterman offered to publish it, but Menu would have sued, and even if Casterman was ready to contend with this trial, I refused to let it come to that. Then the other founders left L’Association the following year for a whole bunch of reasons it would take too long to explain here. I thus published the second part following my return to L’Association with the other founders and at the request of the employees after the general meeting of 2011 and the departure of Jean-Christophe Menu. I’ve started a third series. I haven’t had a lot of time to make headway, but there will be another. BE : One of the differences between America and France is that in France there’s a lot more comfort with the idea of a story taking place over a series of “albums” and of having an ongoing story or character that potentially can continue endlessly (as with Tintin or Asterix, for instance). In America, the term that has come to dominate is graphic novel, and I think readers tend to think of the graphic novel as being contained in the way that a print novel is: a story that begins and ends within a single volume. Do you care much for terms like graphic novel? Do you see Epileptic, for instance, as a series of albums or as a graphic novel? What about Incidents in the Night? The ending of the second volume of Incidents promises a continuation but not necessarily a conclusion: could it potentially go on for several more (even many more) volumes, or do you have the end of it in sight? DB : The term graphic novel has been widely adopted in France by journalists who don’t know anything about it, but who feel like they’re selling something new with it. Same for editors, who before didn’t want to use the term. I make comics, short stories, long stories, some stories episodic and others not. But they’re always comics, and they’re always my work. Incidents in the Night first appeared as a bunch of comic books, then they were collected in a volume. The second part is more of an open-ended story, the third will be something else, and it will continue like that, depending on my inspiration. I can’t foresee the ending: it’s a story that follows an OuBaPien thread. There is a constraint: each chapter follows the outline of the chapters of an esoteric book that has fascinated me for a long time and whose name I prefer to keep a secret. Incidents should thus finish with the end of the table of contents of this book, but life is short, I have a lot of other projects, the book in question consists of a lot of chapters, and I don’t know if I will live long enough to reach the end. BE : Are there any clues to be found in Incidents to the book that serves as its organizational model, besides the organizational model itself? Could an astute reader discover it? Does that book itself make an appearance, even if in veiled or partial form, or do you prefer not to say? DB : This book doesn’t appear in Incidents, even in hidden form. I think it would be difficult for an American reader to uncover this source since it’s a question of a French book that hasn’t yet been translated into English. The only things that might help are the chapter headings. I can’t say any more. BE : I understand that Epileptic was just republished as a collected edition in France by L’Association. How do you feel about the shift in title for that book from the elegant and more symbolic L’Ascension du Haut Mal in French to the blunter Epileptic in English? DB : It’s necessary, I think, for foreign translations. At the beginning I wanted to call my book Haut Mal [the archaic name for epilepsy, similar to grand mal seizure in English], but books by Georges Simenon and Michel Leiris bearing that title already existed. It’s difficult to translate L’Ascension du Haut Mal into another language: the French title includes a sort of language game between Haut and Montagne which is no doubt difficult to render in other languages. “Epileptic” is more universal and works in every country. Simenon as a matter of fact deliberately uses a simple vocabulary so that there will be no obstacle in translating his books into whatever language. BE : The order of publication of your books in the US has been very different from how they were originally published in France, which can’t help but have some effect on how people think about your work. Here, I think your work is most often read through the lens of Epileptic. Do you feel that’s different from France? DB : It’s hard to say. I don’t have a lot of information about the reception of my books in the United States, and when all is said and done, not a lot either about their reception in France. Here, as where you are, the most widely read of my books is Epileptic, and the reading of my other books, the fictional ones, passes through the prism of this “spotlight book” within my work. Some readers only appreciate and read my autobiographical work, others take on the whole of it, others peck at it. The public is sand, a French singer said in one of his songs. It slips through your fingers. Each reader reads the book in their own way. One day when I was autographing a book that I had scripted for Christophe Blain, a reader asked me if Christophe and I were brothers. He thought that Christophe was the Jean-Christophe of Epileptic and that the B of David B. stood for David Blain and thus I wrote scripts that my epileptic brother drew. This reader had invented a whole novel around my story and two homonymies. . . . It’s proof that you can sometimes be very misread. I draw and write very different things, but people always bring me back to Epileptic, which, deep down, doesn’t bother me. The Incidents are without doubt the most autobiographical of my fictions and the most fictionalized of my autobiographical labors. BE : Still, I’d imagine that in France readers are much more aware of Epileptic in context with your other books. Epileptic does strike me as being a little different in focus. Of course, there are echoes back and forth between the books—you can see hints of things like Babel or The Armed Garden in some of the reading the David B. character does in Epileptic—but that personal element, of having a character with the same name as the author, of presenting a perhaps nonfictional account and a personal story, is not as present in much of your other work. Would it be fair to call Incidents a bridge between Epileptic and your other work? In it you have a David B. character (and his brother) who become increasingly fictionalized, with incidents that can’t be folded back into reality in the way much of Epileptic can be. DB : In Epileptic, I also speak, in parallel to the illness of my brother, of the construction of my imagination. And Incidents speaks of my imagination, of the things I like to relate and draw: books, bookstores, and booksellers first of all, then these bookstores are placed in the city where I live (Paris), and some of them are inspired by bookstores that I patronized and which for the most part no longer exist. In the comic I live in the Marais quarter, where I lived for several years. What I say about this quarter is genuine; it’s what I saw there. In the second volume, the beggars invading the Rue Saint Blaise are also a reality: I knew that abandoned street, the decaying buildings occupied by beggars. All these examples are to say that indeed the Incidents are filled with things seen, lived anecdotes. I put myself onstage at the start of the story, then I “killed” myself because I’d had enough of putting myself onstage, I preferred to bring my brother into play, as a way of giving him a life that he’d never had, undoubtedly. He too was an avid reader, and he would have patronized bookstores to his heart’s content if his illness had permitted him to do so. The Incidents are without doubt the most autobiographical of my fictions and the most fictionalized of my autobiographical labors. The element of the imagination is always anchored in an absolutely real basis. BE : What are you working on now? Which of your books would you most like to see published in English translation? DB : As usual, I have a lot of projects. I would like to do the next part of Incidents in the Night. I also have a project entitled Ville des Hommes, Ville des Chiens (City of men, city of dogs) that I would like to see published one day in the United States, but it hasn’t yet come out in France; I’ve only done thirty pages of it. I just finished an adaptation of a tale from 1001 Nights, the first book of which was just published with Gallimard’s Jeunesse imprint, and I just started the third volume of Les Meilleurs Ennemis (Best of enemies), which will be about the two Gulf Wars. Other than that, at L’Association we are planning to relaunch Lapin magazine in a large, newspaper-like format with a lot of authors. We will do a quarterly, which will force it to be as varied as possible. Translator’s note: In French, David B.’s title sounds like L’Ascension du Haut Montagne (The ascent of the high mountain), so the French reader senses that phrase behind the actual title, which refers to the ascent of epilepsy. 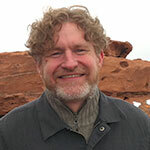 Brian Evenson is the author of over a dozen books of fiction, most recently the story collection A Collapse of Horses. 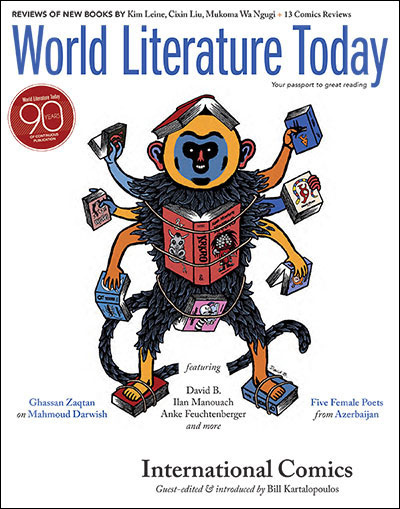 His translations from the French include books by David B., Christian Gailly, Jean Frémon, Jacques Jouet, and others. He teaches in the Critical Studies program at CalArts.